Our initial Australia plan was to spend Christmas week in Melbourne and the week following NYE in Sydney. This was until we looked at the price of lodging in Sydney around the holidays. We were looking at $80 a person for a dorm room in a hostel! It was just outrageous. We changed our plans last minute and decided that we would rent a car and drive up to Sydney over a weeks’ time and stop at a few places along the coast. 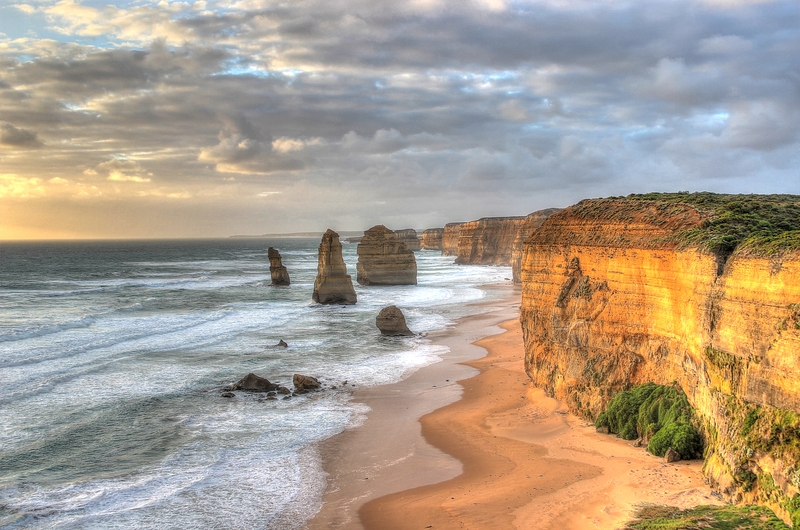 Driving ‘The Great Ocean Road’ (GOR) and visiting the 12 Apostles is a very popular day trip if you are in Melbourne. This was in the complete opposite direction of Sydney, but we couldn’t pass up the opportunity to see such an iconic spot. We also decided to drive a few hours even more out of our way to Grampians National Park. We did a short but steep tramp (what the Australians call hiking) up to an amazing overlook. Once we were at the top we could see to what felt like the end of the earth. After that we headed down to the GOR and began our trip towards the 12 Apostles. This coastal drive has some of the most spectacular views I have ever seen. We arrived at the first lookout and were floored by the dramatic landscape in front of us. Aqua blue waters, giant sand colored cliffs with white waves smashing powerfully against them. We drove a little further until we got to the Apostles. There are actually only 8 – I don’t think there were ever actually 12 of them. Many of them have fallen over the years due to erosion. There were (as usual) a TON of people around the lookout. It was so stunning as the sun set that no amount of people could take away from it’s beauty. After dark, we headed back towards Melbourne to our campsite. We arrived in the dark to a sign that said it was full and that you needed to reserve ahead of time. We thought for sure that we were screwed. There was a gravel road nearby that we were thinking might lead us to a secluded place that we could sneak a tent and leave early in the morning. At the end of the road we found another campsite with ONE empty spot that may have not actually been an official spot, but it was good enough for us. We set up shop and were drifting off when I heard a noise that sounded like an angry boar in the woods. I panicked and asked Rob if he had heard it – he had – but he decided that sleep was more important so he told me that “it was probably some bird” and I should just close my eyes. I heard this noise 3 or 4 more times throughout the night and each time Rob told me to relax and go back to sleep (later I found out that he was just as nervous as me, but didn’t want to get up to check it out). Continue reading to our Philip Island post to find out what the noise was! We got up early the next morning to head to our next stop along our route but were quickly diverted from cooking. Our campsite was invaded by a nosy visitors coming from all directions. We had 3 wild parrots sitting on our car! Rob approached one of them slowly with some bread and within minutes, the bird was sitting on his arm and eating out of his hand! I joined in on the fun when a cockatoo came up wondering what was going on. This went on for about 20 minutes until we had to leave. The birds were amazing, especially the giant cockatoo, an experience we’ll never forget. Our next stop was to see… PENGUINS! We had a few other things to see before we got to them though. Rob started out with a late afternoon surf, while I relaxed on the beach. The waves were big, and it took a solid swim and a little luck to make it to the point of catching a break, but equally rewarding to ride a few. After hanging ten, we had a date with some Koalas! There was an awesome conservatory on the island filled with Koalas. They are as cute as the look in pictures. We did notice that when they walk on the ground they look like little old men, very hobbly. It was apparently mating season because we heard a few of the males call out to the females, which was when we realized that THAT was the noise we had heard in the middle of the night at the previous campsite! Had we known it was a koala, Rob may have gotten up to go find it! Intermixed with the koalas were a few wallabys (a wallaby is a darker, smaller kangaroo). On our way to see the penguins, we saw an echidna on the side of the road. Rob attempted to get it to flip over but it was so terrified that it just curled up into a tiny little spiky ball. It was finally time… we were so anxious to see our little formal friends. The conservatory had bleachers set up on the beach and once dusk hit, the penguins began popping up in little groups. We would see a group of 5 or 6 peek their heads above the water close to shore and then they would ride the wave in and out until they were able to get their footing and then waddle their way to the nests on shore. They didn’t allow you to take pictures or videos so of course we snuck some of both anyways – we will post the videos soon! Later that night it was a total change of pace as it was time to celebrate New Years Eve! We bought a streamer gun, 2015 hats and a bottle of champagne. Here’s a quick recap of what transpired in hands down, the weirdest NYE ever. Consider socializing with fellow campers around the park, decide they are all underage, morons, or a combination of the two. Elect instead to do a power hour in the car. Receive a knock on window at 11:40, invited out by some non-morons to go down to the beach. Dubbed new friends, dude, chunk and double chunk. Quickly decide new friends are also morons. Chunk and double chunk maintain inadequate pace to arrive at beach by midnight (despite it being their idea). Watch fireworks. As a group, make fun of idiots poorly attempting a beach bonfire. Chunk and dude run off to join fellow idiots. We announce our intention to take a walk down the beach by ourselves. Double chunk announces her intention to impose on our walk. We progress down beach, slowly. Stop for break on account of DC. DC begins listing her life’s problems to us. We attempt to counsel her on her array of issues (I sleep too much, my fiancé is now dating my best friend, I eat unhealthily). DC abruptly changes subject, inquires about our musical tastes. We request something uniquely Australian. DC responds by playing Nickelback. Athena laughs, then needs to backtrack when we learn this is not a joke. We then decide it would be better to join bonfire with idiots. Bonfire goes as expected, idiots live up to their reputation. Give away 2015 hats and in exchange we get to leave. Head back to the campsite… On the way back to the campsite, encounter two kids attempting to start a driveway bonfire. We strike up a conversation, and learn that they are 15. Their parents come out to yell at them and ask who we are. We are invited in for a drink. This turns into hanging out for 2 hours. We all get drunk and Rob is invited to go fishing tomorrow. We stumble the rest of the way home and fall asleep. Rob wakes up in 3 hours for fishing. (multiple fish end up being caught) These are the highlights of NYE 2015. Wallarag – town in Australia or made up word?